Dan Millman is the author of, “Way of the Peaceful Warrior: A Book That Changes Lives” and “The Creative Compass: Writing Your Way from Inspiration to Publication.” He’s also the former director of gymnastics at Stanford University and a former world champion athlete, martial arts instructor, and college professor. Jason Hartman: It’s my pleasure to welcome a name you have probably heard of, and if you haven’t heard of the name, you may well have read some of his books because they are fantastic. That is Mr. Dan Millman. He is author of Way of the Peaceful Warrior: A Book That Changes Lives, and the Creative Compass: Writing Your Way From Inspiration to Publication. And he’s also a former director of gymnastics at Stanford University, and if you’re familiar with The Peaceful Warrior you can see the connection there. Dan, welcome. How are you? Dan Millman: Doing great, thanks Jason. Good to speak with you. Jason Hartman: The Way of the Peaceful Warrior, I’m guessing is your most famous and most popular book. It’s certainly the way I became acquainted with your work many, many years ago. And I just love it. I love the movie, I’ve seen the movie three times, went through the audiobook once, and the printed book once as well. It’s just a fantastic story and there’s so many great life lessons in there that we all need to learn and relearn, I should say. What was the inspiration for that book? Dan Millman: Many people I know who are authors, who happen to get lucky enough to find some success in this field can look back and reconstruct their lives as if it all happened through some clever strategy and secret that we know for living. But actually I just had a heart felt desire to share my experience. I’ve been on my own quest for meaning. What is life about? What is the bigger picture? What’s beyond usual life of having our nose to the grind stone and just kind of pushing ahead to try to be successful and happy. So I started to explore in my own life, not just how to have great talent for sports, which I was a coach and a world champion athlete in gymnastics. Back then it was all about talent for sports but then I came to expand my interest into a talent for living. What does it mean to really live well? What do we really want in life? And it seemed to me that behind every search Jason, whether it was a car or money, a good relationship, we believed those things will make us happy, will do the trick, will once and for all give that sense of satisfaction and fulfillment. So I began to explore that question of happiness and what leads to it, what doesn’t and what’s temporary and what’s more lasting. And, in a sense, all of us are on this quest. Whatever we think we need, the needs that is, we want that sense of happiness. And then later on became more about a sense of meaning and purpose and connection with other people, with ourselves and with the bigger picture of life. So that search led me on maybe a decade long intensive quest around the world with different mentors. And finally it developed into an approach to living that I came to call The Peaceful Warrior’s Way, and I wrote a book to share my insight about that. And it just seemed to click. As we say in the writing field, if you capture the universal and the particulars of your story, then you’ve got something. And many people seem to respond to the story. I had no idea they would, I just needed to share it. And the rest has unfolded through word of mouth over the last 30 years. Jason Hartman: That book has been just a tremendous success, and I know it’s had a lot of very positive impact on people in the world in general. We’re going to talk here about your work and the different books, and also about your latest book. And learn a little bit about writing, for those in the audience that want to write or want to improve their writing, if they’re writing already professionally. Tell us about the success of The Peaceful Warrior. Do you know the numbers of how many copies it sold? Dan Millman: Well I can only give a general amount. Millions of copies in about 29 languages worldwide. I say about because sometimes a book is out of print in one language and they print it in another. So about 29 languages. When the book first came out Jason, it was subtitled “a basically true story”. It’s an autobiography with some fictional elements for the sake of story based on something Pablo Picasso once said. He said, “Art is a lie that helps us to see the truth”. So it’s not that I wrote something and called it a memoir, but actually fictionalized it. I never called it a memoire. It is a story that combines fact and a higher truth based on fictional narrative. So when the book came out, that subtitle puzzled the bookstores. They didn’t know where to put it. Very few bookstores wanted the book and it went out of print. I had a failed hardback. It did so poorly that the publishers said just give him the rights back. But the editor was saying wait a minute, we’re starting to get a lot of letters about this book, very enthusiastic. But they said just give him the rights back and let’s move on. Well, to his chagrin, about three years later an old gentleman named Hal Kramer who was 70 years old discovered the book and contacted me and said let’s go out to lunch. I said okay, and he said I’d like to reprint your book. And I said well, how much money are you going to give me for an advance? And I was being more sophisticated then. And he said how about 100 dollars? I said that doesn’t seem like very much, well how much are you going to spend on promoting the book? He said not much money at all. I’m just going to write some letters to book stores and tell them I’m back in business. I said, well how many people are in your organization? He said it was just him. Now my agents were saying don’t go, don’t do this. But I did it anyway. There was something about it that felt right. And now 30 years later there are millions of copies out there in many languages. And it took him actually 2 years to get the bookstores to carry one copy in each chain. But then the magical thing that every author hopes for is word of mouth. People started telling other people about the book, and that’s what happened over time. And it just expanded and now 30 years later it’s still going strong, and as you know they made a movie out of it with Nick Nolte in 2007, it was released by Universal Pictures called Peaceful Warrior. So it’s not as if I have that cliché we’ve heard many times, ten years to become an overnight success. It took a long time after people started reading the book and writing. My wife said Dan, people are asking more about this approach. What is a peaceful warrior and how do you live this way? And so I made a cassette tape, about an hour and a half cassette tape and we would sell it for $20 cash, and people were actually sending us money in the mail and we could buy groceries. And then more and more people started, and I made a second tape and then a third recording. Pretty soon we had a brochure, a business, I started getting invited to speak places. So when people write me Dan, how can I become a speaker or an author? I haven’t a clue because there’s no trail of breadcrumbs, there’s no trail of stardust that people can follow. And many people will claim to give formulas, but really all we can control is our efforts. The outcomes, we have to be a little more relaxed on that. We can’t make things happen in life, as much as many will tell us that. But by making a good effort, we’ve vastly increased the odds of success over not making a good effort. So that’s what I’ve done over the years. Jason Hartman: Let’s talk about the book itself, and I know this is I’m sure woven through a lot if your work. When you consider the lessons of The Peaceful Warrior, there are so many just profound, profound things. There are no ordinary moments. A warrior acts, a fool reacts. All of these great different little gems, they’re amazing. Let’s talk about how we can use some of these things in our lives. Maybe that hour and a half $20 cassette tape has a lot of that great content. Dan Millman: I have a story that might convey some of the core idea of a number that I convey in The Way of the Peaceful Warrior and my teachings over these years. I was in the gymnasium and I was there alone except for the old man, my old mentor I called Socrates, the old gas station attendant. He happened to be available that night and he was watching, and I did a dismount off the high bar. People have seen me on the pics and it was a multiple twisting double summersault, and I stuck my landing which is a good thing in gymnastics, and I went Yes! And I figured that was a good place to stop for the evening. So I tore off my sweatshirt, threw it in my workout bag, and we were walking down the hallway afterward and Socrates turned to me and said, you know what Dan? That last move you did was really sloppy. And I said what are you talking about, Socrates? That was the best dismount I did in a long time. He said no I’m not talking about the dismount you did from the horizontal bar, I’m talking about the way you took off your sweatshirt and put it in your bag. And he was again reminding me that I’d treated one moment as special and another moment as ordinary. So we underscored again, there are no ordinary moments. That’s an illusion. This moment will not pass again. But then he added something, which was profound for me and I actually got that line into the movie at the last minute before they started shooting. That’s when he said Dan, the difference between us is that you practice gymnastics, I practice everything. He practices living. Walking, breathing, eating, signing one’s name, interacting with other people… it’s a constant practice to improve over time. And that helps us get into the flow and into the moment. When we don’t treat moments casually, when each one, as I’m spending with you right now, counts for something. Not in some stressful way, but in a way that is like being absorbed in a favorite sport, at throwing Frisbee, or where we’re really paying attention, being this buzzword today is being mindful. But it really does pull us into the present moment, which is the only moment of reality. The rest is imagination and memory. Jason Hartman: There’s some talk in the quantum world. They say that time is an illusion. You’ve probably heard that, maybe you’ve written on it. When you talk about this present moment and it will not pass again, and how there are no ordinary moments, do you have any comments on that time is an illusion concept? Dan Millman: On many levels, whether philosophers, metaphysicians, or scientists, or physicists, time is a paradox. Because on the one hand, there is no such thing as the present moment. Absolutely no such thing. Any physicist will tell you that. If I say the word “now”, did I capture the present moment, or between the time I said “Nnn“ to the time I said “Oww” did a million nanoseconds pass by? Which nanosecond was the present? So in a sense we can’t capture the present moment. But it’s a term we refer to because in a sense, that’s all there is, is the present moment. Imagine each of us, maybe your listeners can imagine themselves sitting in a boat, serenely in a small boat flowing down a big river carried by the current. For someone on shore, watching us pass by we seem to be moving in a river of time from past to future, but where we are, sitting in that boat, we’re sitting calmly in the present. Always the present moment. So we speak of the present moment simply as being attentive to what’s in front of us now rather than getting sucked into regrets about the past, anxieties about the future… the future never comes. It’s always now. And there’s always another future to imagine. Mark Twain said it well. He said, “I’ve had many troubles in my life, most of which never happened.” Because they’re happening up in our minds in the past and future. Many of us, I think your listeners might relate to the idea that we wake up some mornings with 16-20 things we have to do that day. What a busy day it’s going to be. But actually the reality is that we only have one thing to do when we wake up, which is open our eyes, and then sit up, and then put our feet on the floor. In other words, my life is quite busy – yours probably is too. But my life is quite serene because I finally recognized I can only do one thing at a time. I don’t have to do all those things at once, even when I juggle, which I often teach at some of my workshops as a metaphor for life and a form of dynamic meditation and so forth. When I’m juggling I’m only throwing one ball at a time. When I taught Marshall Arts, multiple attacks, you only have to deal with one at a time. Sometimes in rapid succession. So the more we focused on this one thing we do each time, the more we call it mindfulness, the more presence we bring to life. Jason Hartman: I remember Og Mandino talking about how life is just a collection of moments, and you string those moments together and that’s what’s called a successful life. But it’s nothing more than just piecing those together. What really then Dan, is the source of stress and anxiety and worry? Is it just us fretting about the future, trying to project our souls into control over something that’s going to happen ten minutes from now, ten hours from now, or ten years from now? 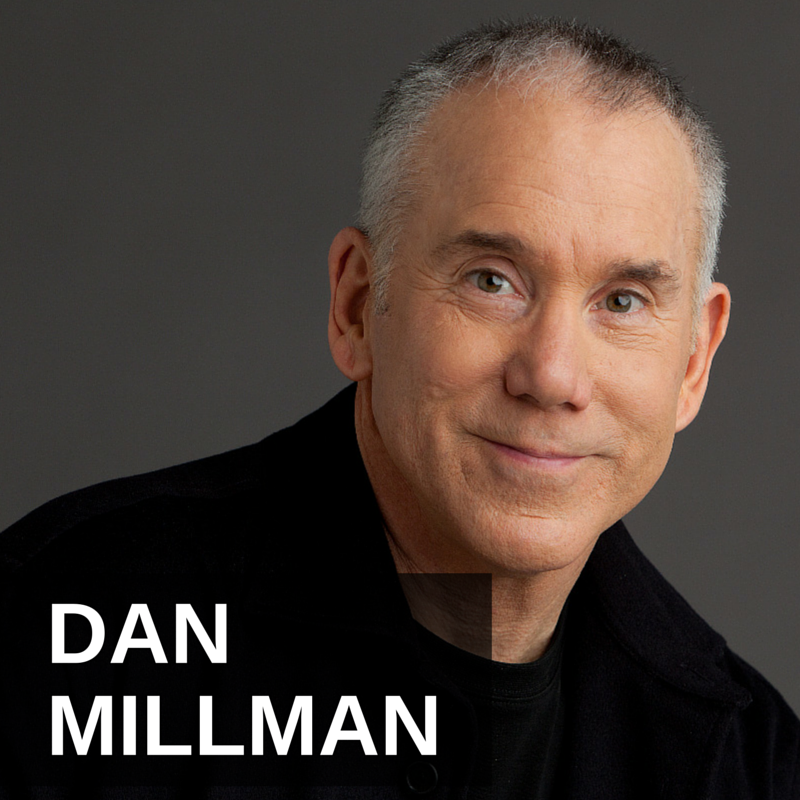 Dan Millman: Well one of the chronic human habits is playing God in the sense of we think we know what should happen or what has to happen, but actually we don’t know. Life is a spontaneous improvisational affair. We prepare for things, they don’t turn out the way we thought they would. So look, we’ve all heard the saying, “Luck is preparation meeting opportunity” and that sort of thing. Yes, in reality we can prepare ourselves. We can prepare us physically, mentally, emotionally but we still take life as it comes. In other words, life comes at us in waves that we can never predict or control but we can learn to surf the ways of change. And that is a human skill, and a spiritual skill if you will, about life’s bigger picture. So there are practical things that we can learn about how to approach life. For example, a very practical approach is to be successful at what we do. We have to be good at two things. We have to be good at what we do, and we have to be good at promoting what we do. Whether it’s a service or whether we sell a product. Because if we’re doing something positive for people, we can’t help them unless they know we exist. So promotion marketing is a part of life. I let as many people as I can know about my books. I don’t know whether they should read it or not, that’s for them to decide. But I can at least make the effort to let them know about them. And so that’s what we all do in a very practical sense. [0:14:02.5] may be a Segway into writing. He once said there are three essential rules for writing a successful novel. Unfortunately, nobody knows what they are. So there are no formulas, as much as people would like us to believe there are these formulas. There are bits of good advice and principles that we can live by. Jason Hartman: You mentioned everybody looking for the formula of the great American novel, as it were. There are some formulas – certainly the hero’s journey is a formula, right? And that’s a popular one throughout history and it seems to be a successful way to tell a story, if you will. I know it’s not about writing a novel per say. But formula, no formula, I sort of struggle with that. Dan Millman: Yeah, you raise some very good points. There is a difference between a rule and a principle. Rules don’t apply to everybody. But principles apply to many people most of the time. So yes of course there are principles in writing like the hero’s journey, a reluctant hero… Luke Skywalker is a great example. He doesn’t want to go on a quest, yet he’s forced to. In my new book The Creative Compass, written with my daughter in collaboration, we describe five universal stages of the creative process. So certainly it’s a book on writing, but it’s also a book on any creative endeavor. I bumped into David Blaine just the other day in New York. He’s a magician and he’s working on new elements for his performances, and he’s going through the same things that a writer might with writing a book. Those five stages are: Dream, everything begins with a dream. And then The Draft, when we bring those dreams into reality through our efforts. We actually create something. Through our own efforts we become a channel for these dreams. And nothing happens unless we do. Thinking about doing something is the same as not doing it. And yet, we do have to spend some time percolating. That dream phase is important. Then we draft, and we draft with beginning and end in mind, a vision we’d like to bring into the world. And then many people skip the next crucial stage, and they jump right to the fourth universal stage which is refine. So in writing, they go from drafting and they write it over a few times and then they polish and they choose the right words and they do some cutting, and then they think okay now it’s clean and ready. Finally, they go to the fifth stage which is share, to begin to promote and share your book and your creation with the world, but often they don’t work. Somehow they don’t get an agent or get published, or the book doesn’t do well when it’s published because they skip the third stage I haven’t mentioned, which is the Develop stage. When we want to get candid feedback. Test it, get it back, revision. Is this really what I wanted to create in the first place? Sometimes it needs a complete rewrite, completely going back to the drawing board. Those willing to do that, often that can make all the difference in the world. So these five stages aren’t rules, they’re not a formula for writing a successful book, they’re simple a description of what all creative artists go through, whether they’re painters, business people who go through a process from beginning to end. So I think many of your listeners can relate to those stages in what they do, whether or not they happen to be writing a book. Jason Hartman: That’s a very good way to put it. Dan, tell us about some of your other books. The Peaceful Warrior was the big blockbuster, but how many do you have total? Dan Millman: Actually, I’ve written 16 different books of varying topics. They say we teach what we need to learn, and I’ve needed to learn a lot. 16 books over the last 30 years. By the way, I should mention for those not familiar with my work, and wonder what is a peaceful warrior? It really is that we’re all striving for a peaceful heart, but there are times we need a warrior spirit in life. No matter male, female, no matter what our age, both of those things are important. It’s about having our head in the clouds but our feet on the ground. So that idea, that term has appealed to many people because it applies to all of us. It’s not a club you need to join or an initiation fee. It simply describes all of us in our daily lives doing our spiritual weight lifting on planet earth. The other books describe other facets. I have a book titled No Ordinary Moments, another book The Life You Were Born to Live, a more recent book which is really a compilation provides a context for my work. It’s called The Four Purposes of Life. And many other books… The Journey of Socrates, the novel. And Every Day Enlightenment talks about 12 gateways to what really constitutes personal growth and development. I found it necessary to write all those books. Stanislaw Lec, who wrote a book called Unkempt Thoughts while at a concentration camp in World War II, he said “I wanted to tell the world just one word. Unable to do that, I became a writer”. I know we’re drawing toward a close Jason, and I do want to mention that a young man came up to me once and said, “I know you charge a lot of money for your personal consultations, but I’m a poor college student and I only have a dollar with me. What can you tell me for a dollar?” So I told him 6 words that could change his life, and could change the lives of your listeners as well if they really practiced this. And those 6 words were: Hear and Now, Breath and Relax. You asked about stress before. Stress happens in our lives when the mind resists what is. That’s why I got into the idea that we play God, we think we know what should be. But if we learnt to surf the waves of change, if we learn to use what comes our way for our betterment, we experience less psychological stress. And when we remember to breath and relax, we have a practical way of dealing with tension. Because stress without tension and stress with tension are very different experiences. Jason Hartman: It’s stress versus you eustress, I think. So that’s fantastic insights there Dan. Your website is peacefulwarrior.com, and there’s just a lot of great content on there so thank you for providing that. You can look at Dan’s work at peacefulwarrior.com, and of course if you look on Amazon.com you’ll see that his books have many, many reviews, fantastic four and a half and five star ratings. They’re just fantastic. Dan Millman, it was great talking to you and thanks for joining us today. Dan Millman: It was really a pleasure.